It shouldn’t have been like this. It wasn’t supposed to be. This was supposed to be Burns vs Small, Owen vs Ginn and, if every card fell right, Davis Daniel vs James for State. It was supposed to be the Auburn offense against the starting pitching of State and could they knock them out to get to the suspect bullpen of the Bulldogs. And on the other hand, it was the State offense trying to do the same and test the freshmen arms the Tigers brought to town with Cody Greenhill leading the way. However, that’s not what we got. We got Tanner Burns, finally, unfortunately, looking human for the first time this year, and the Auburn offense passing its first test by knocking Small out of the game and getting a massive Friday Night win to do what was necessary in a road series, don’t get swept. Saturday and Sunday were maddening afternoons for Auburn fans. Saturday was lost early as the Tigers just didn’t have the right arms to get the Bulldog bats to quiet down while it was near impossible to get anything started on JT Ginn and crew. Sunday was an offensive slug fest that saw State build a lead, only to have Auburn take it and run with it till the 7th, only to see State take it over again as neither team had a pitcher that could consistently get outs. State scored at least 1 run in every inning of game 3 capped by a 5 run 8th that put the game out of reach while both teams had 21 hits apiece. While it was a frustrating way to drop a series, take solace in this if you are an Auburn baseball follower. 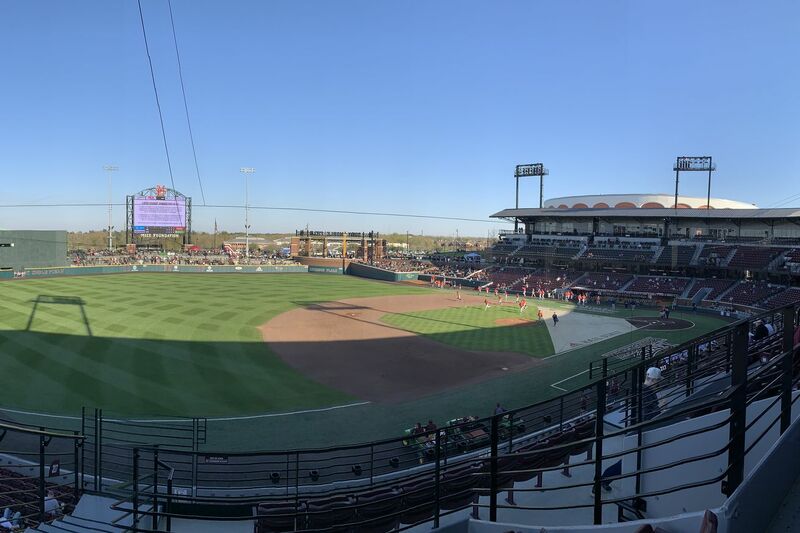 Auburn went to Starkville with 1 starting pitcher who didn’t have his best night and slugged it out with the consensus number 2 team (and the hottest team in the country) and probably should have taken the series from them, and that was missing 2 of their 3 best pitchers. Sure, a lot of work needs to be done with the young pitchers, but anyone who didn’t think that was kidding themselves. This is still a very good ball club, that definitely isn’t up for debate anymore after this weekend. The question now is, can this very good ball club pick up the pieces of a lost weekend and push to become a great team as guys get healthy and experience starts to grow. For your pregame viewing pleasure. This one is a pretty rough spot but I will go with Cody Greenhill’s Friday Night performance as the winner here. With State fans all over him, trying to distract Greenhill from a newly found 1 run lead, The Bull came in a only allowed a hit while striking out 2 in a huge 2 innings of work that will more than likely be forgotten in May but were so huge this weekend. Without that shutdown work against an absolutely scary Mississippi State offense, this might have been a lost weekend. Both Greenhill and Anderson, along with Burns after that 1st inning, were fantastic and just what Auburn needed to do what it had to and not get swept in Starkville. This weekend I was really taken with the performance of Conor Davis. Coach Thompson has remarked that Conor is starting to become more consistent with his at bats and I was eager to see if he was correct this weekend in person. Well, coach was right. Davis has always had the talent to be a pure hitter and I, personally have been waiting to have him hit it. He is starting to get there. The big junior went 8 for 11 on the weekend with a triple, 3 runs scored, an RBI and a walk. If Davis can keep that kind of production up, along with the bottom half of the lineup (Bliss, Howell, Ward and Scheffler), Auburn truly can go 1 through 9 and not have any true let up. It’s a very scary thing for clubs around the league if this continues. The Tigers head back from Starkville and make a pitstop in Montgomery for the Capital City Classic in Montgomery against Alabama. This is actually a horrible time for this game as Auburn’s pitching staff has all seen some type of action this past weekend in some way shape or form. Look for Garrett Wade to get the start again this week as he only saw 2 batters at State. From there, Auburn will hit the road again to take on South Carolina who has started the year 1-5 after dropping the series to Tennessee. Will Jack Owen be back for this series? How close is Davis Daniel? Can the Tigers take this series over a team that is reeling? Can Auburn once again take the Capital City Classic over an improving quickly Alabama team? All things will be answered in the next 7 days.